The Dog on the White Line. 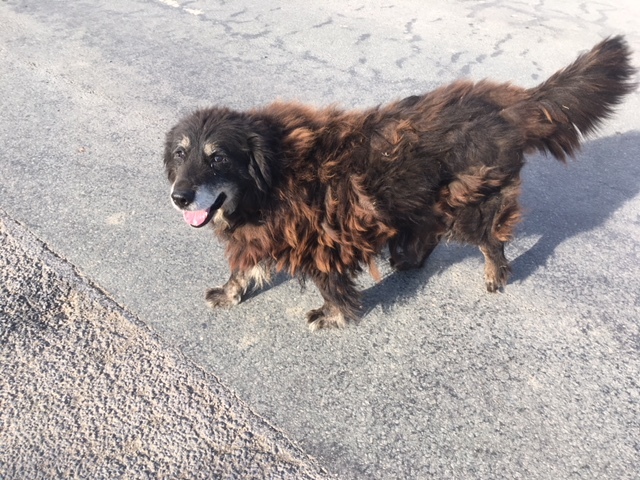 The old dog was outside the community hall. I was pleased to see him. He looked healthy and bright-eyed although he could certainly use a good brushing. His hair is coming out in huge clumps. He is scruffy. He greeted each car as it drove up and he greeted each person as they got out of their car or as they left the hall. He was not aggressive nor was he begging. He was just interested. He is the same old dog who used to come up to visit Frank at the shop every morning. Frank would give him cake or some other treat that had reached its sell-by date or had just gone stale. Then the dog would sleep for a while. He always walked home in the middle of the road right along the white line until he reached his house. Since Frank has been ill and the shop has been closed, maybe the dog has decided that evenings are a more sociable time for visiting the shop even if it is not open. Or maybe he comes in the morning and also in the evening. The section of the road with the white line is not a long stretch of road but it is long enough that anyone who drives it regularly knows that the dog on the white line has priority. 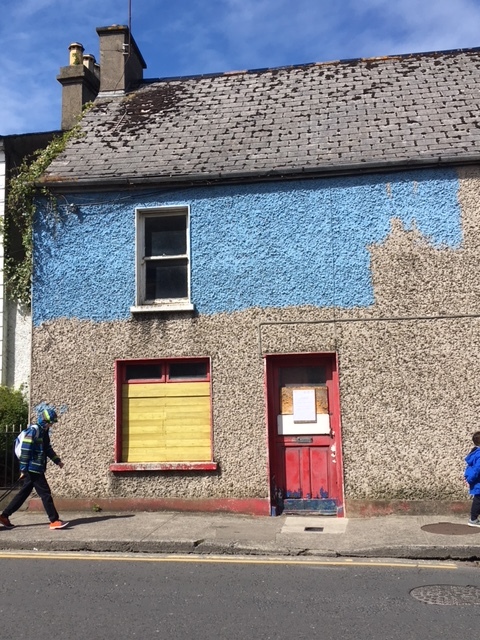 It is more than ten years since someone started to paint the house in Irishtown. Maybe it is more than twelve years. It might even be longer ago than that. For as long as I can remember the house has had just this amount of blue paint on it. Someone started in the upper left corner and continued as far as the paint went and then they took a break and no one ever returned to finish the job. Painting this kind of pebble-dashed surface uses up a lot of paint. It demands a lot more paint than a regular wall. Maybe the person who began the painting thought he had enough paint for the whole house. Maybe he was not able to get the exact same colour mixed again. The person who began painting has not returned to finish it. Nor has anyone else. Now the house is empty. It is boarded up. Somehow there is still a freshness to the blue paint. It looks like the paint job might be completed any day now. I have some tiny plastic tubes with one open end. They come with the little flossing brushes. They are for protecting the little brushes. If I go somewhere I can slide the brushes into the the tubes and then they will not get bent in transit. I rarely put the brushes into the tubes at home. I just line up the different sized brushes on the shelf. This morning I picked up one of the tubes which looked different than the other two or three. There was something in it. I banged it on the side of the sink. A little tiny slug had worked its way into the tube and could not reverse out. It was stuck. Most of the slug came out. Part of what I think was the head remained inside. I was busily trying to flush it out with water for several minutes before I questioned why I was doing it. I did not want to re-use the tube that the slug had been in. I threw it away. Even with the erratic weather and the cold nights, I could tell that winter was finally over. Things in the bathroom are sort of protected by the cold weather but nothing is ever completely safe. Once the slugs have made their way back in there is nothing that they won’t ooze and creep over on their way to somewhere else. Nothing is safe. On the whole I would rather not know where they have been.